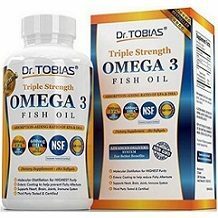 The following is our review of Dr. Tobias Optimum Omega 3 Fish Oil. It claims to help support your heart, brain, joints, and immune system. Omega-3 fatty acids have been scientifically shown to be crucial to health and extremely important in the prevention of illnesses. This product was purified with molecular distillation and provides an advanced delivery system. It was also made in an FDA registered and GMP certified facility. Continue reading for our full review. Other ingredients include gelatin, vegetable glycerin, purified water, enteric coating, and natural vitamin E. This product contains herring, achovy, sardine, salmon, mackkerel, and soy. These ingredients have been shown to prevent illnesses such as heart disease, arthritis, ADD, depression, stroke, cancer, diabetes, high blood pressure, obesity, osteoporosis, Crohn’s disease, ulcerative colitis, eczema, learning and cognitive development problems, and Alzheimer’s. It is recommended to take 2 softgels daily with meals as a dietary supplement, or as directed by a health care professional. The softgels are meant to be swallowed, not chewed, and not meant to be let dissolved in the mouth. You should consult a physician before using this or any dietary supplement if you are pregnant or nursing, under 18, or have a known medical condition. Do not use when product has expired. This product is manufactured and packaged in a facility which may also process milk, soy, wheat, egg, peanuts, tree nuts, fish and crustacean shellfish. 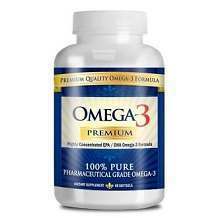 Dr. Tobias Optimum Omega 3 Fish Oil can’t be purchased directly from the manufacturer. We found it sold on Amazon for $29.97 for a bottle of 180 softgels which will last you 3 months. As you can see, this product is very affordable. We were unable to find a guarantee for this product. A lack of a guarantee shows us that the manufacturer doesn’t have much confidence in their product’s effectiveness. It doesn’t give the customer much confidence either, as well as a risk-free buying experience. Return policies will vary based on which retailer you purchase from, so be sure to ask. There are a couple of positive things about Dr. Tobias Optimum Omega 3 Fish Oil. It is sold for a very fair price and 1 bottle will last you 3 months. This product also has many customer reviews, most of them being positive. Customers were pleased that this product had no fishy taste. One customer even said it helped relieve their joint pain. There were a couple of negative things as well. This product is not backed by a manufacturer guarantee which only leads us to believe that they must not have much confidence in their product’s effectiveness. It also does not give you, the customer, much confidence either, as well as a risk-free buying experience. Some customers who tried this product were upset that it caused them to have fish smelling burps. We feel you can find a more effective product elsewhere.